China is one of the fastest growing markets for mobile devices. We know device makers are making money off of this trend. But how do mobile app makers cash in on this ballooning market of upwardly mobile consumers? The short answer is make iOS(s AAPL) apps, according to a study released Tuesday by mobile ad platform Guohe Ad. The Chinese smartphone market is huge — as of November there were 118 million 3G smartphone owners counted — and this study, which surveyed 600 people, is admittedly a small but telling portion of that. Don’t believe the current conventional wisdom. Though there’s an impression that Chinese consumers just don’t like to pay for apps, that’s changing. The study found that almost two-thirds of iPhone users, or 62 percent, have purchased at least one app for their device. Seventeen percent have purchased more than 11 apps. A big part of this shift in buying behavior has to do with Apple’s decision to start taking local currency payments last fall through the iTunes store instead of requiring credit cards that processed U.S. dollars, says Guohe. 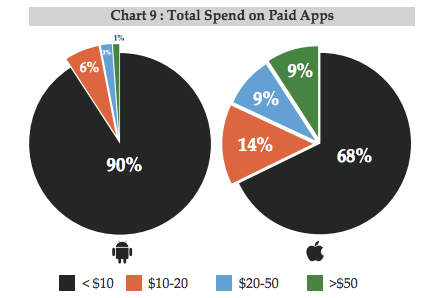 Target iOS devices for paid apps. If you’re looking to make money on paid apps and weighing Android over iPhone, iPhone owners in China are more likely to buy apps. Guohe found that just 23 percent of Android(s GOOG) device owners had purchased at least one app, compared to iPhone’s 62 percent. This is similar to the dynamics the larger mobile market. Piper Jaffray calculated in November that of the 6.8 billion Android apps downloaded, just 1.3 percent, or 90 million, were paid for. Target Android for ad-supported apps. 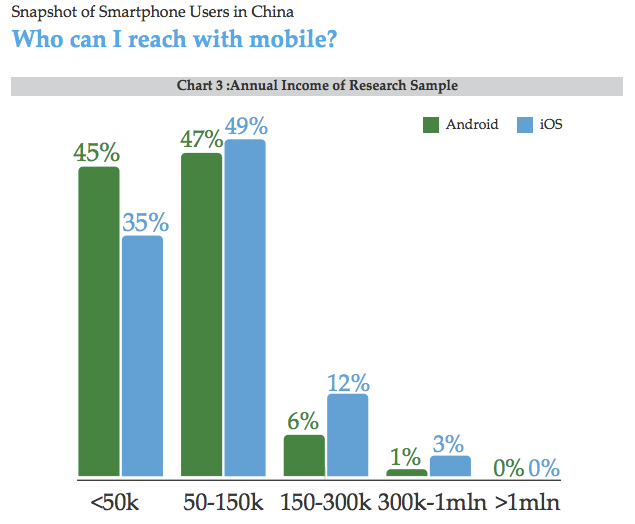 Android growth in China has been huge and it is a good platform to reach the largest group of people. In fact, more than half (54 percent) of those surveyed for this study carried an Android smartphone. So, even if you want to distribute your app for free, an ad-based model will work in this market. “The opportunities sit on a data-driven approach to target the right audience from millions,” Guohe says. Of the Android owners polled, 63 percent said they’d prefer free apps with embedded ads, versus 13 percent who said they’d prefer ad-free apps they’d have to pay for. Again, this is very similar to download patterns in the U.S. and the larger Android market as a whole. These statistics should be encouraging for app makers interested in selling apps in the China market. And while clearly the above chart shows that far more smartphones owners’ incomes lay on the lower end of the scale, that’s changing pretty rapidly. As the middle class there continues to grow, more people’s ability or desire to pay for things like apps will too. I don’t think is the owners of iPhones desire to buy apps is that mostly every good app on android costs money while on Android the counterparts of those same apps with almost same specs are free or cost less. Everyone likes to have free stuff but while iPhone stays in the top as a high quality smartphone everyone is going to buy it and are going to have to pay for apps even though they might not want to, but they need the app so they pay for it but that doesn’t mean they wouldn’t try to get the app for free.